An international team of scientists has invented a cheap solar device that can store energy from the Sun more efficiently than anything on the market. One of the biggest problems with solar power becoming a more viable and cost effective alternative to fossil fuels is what to do when the sun isn’t shining. An international team of scientists has figured out a solution, and it just might be the most promising one yet. Led by Michael Graetzel, director of the Laboratory of Photonics and Interfaces at the Ecole Polytechnique in Switzerland, the team has created a device that can collect energy from sunlight and convert it to hydrogen, which can be stored and burned as fuel or fed through a fuel cell to generate electricity. Named a ‘water splitter’, the device has been tipped as the next big thing in solar technology, says Kevin Bullis at MIT’s Technology Review, because it meets three of the four criteria needed to create a practical device. Firstly, it’s highly efficient. It’s made from a new type of material called perovskite, which was discovered in 2009 and found to absorb light much more efficiently than silicon, which is what solar cells are currently made from. According to Bullis, it can store 12.3 percent of the energy in sunlight in the form of hydrogen, which is pretty huge, seeing as 10 percent is the accepted benchmark for efficient solar-hydrogen converters. Secondly, it’s cheap to produce, using only inexpensive materials. And thirdly, these materials are abundant to source, so the device is also easy to make. 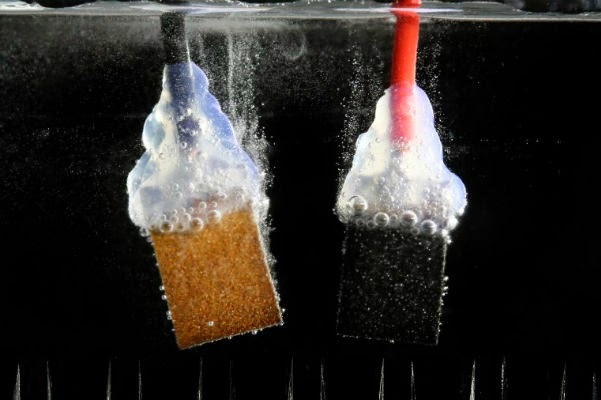 On top of perovskite, the device uses cheap nickel and iron to act as catalysts in its two ‘water-splitting’ electrodes – one that produces hydrogen and one that produces oxygen when they react with water. “The catalysts built on previous work showing that nickel hydroxide is a promising catalyst, and that adding iron could improve it. The researchers added iron to nickel hydroxide to form a layered structure, and put the catalyst on a porous nickel “foam” to increase the area across which reactions can take place, speeding them up,” says Bullis. The fourth criteria needed for a practical device is reliability, which the team is now working on increasing. Right now, it only lasts for a few hours before the performance of the solar cell starts to decrease. This is because perovskite degrades much faster than silicon. But the team, which includes researchers from Switzerland, Singapore and Korea, has figured out how to extend this lifespan to over a month by adding a layer of carbon to it. They’ve published their results in the journal Science. They’re now working on increasing this further.